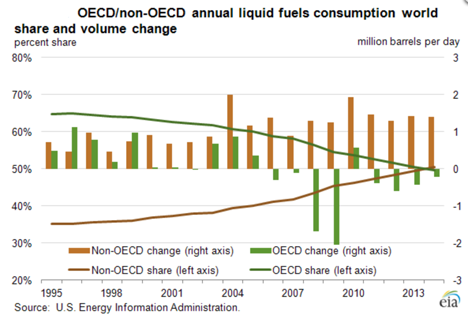 The EIA has noted, in This Week in Petroleum that, for the first time, the sum of Non-OECD country demand contributed more than half to the total of liquid fuels consumed in the world. It does, however, point out that the projections of the Short Term Energy Outlook are for the two curves to re-intersect at the end of 2014. The reality of that second assumption is, I rather suspect, more based on hope than reality. Once you start providing power, and all its benefits, to the general population you are on a slippery slope that it is almost impossible to back away from. Consider (as a small example) the problems that Egypt is currently having with the supply of subsidized bread to the general populace. Once you start supplying a commodity at a subsidized price it becomes very hard to change the equation, and too much of the non-OECD world is now living in an economy where energy use is subsidized. The problem that the above graph fails to recognize is that you cannot wean a culture from subsidies in the immediate short term and still expect their government to survive in its present condition. 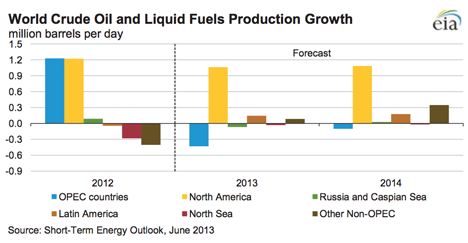 Thus when the EIA project that global demand will grow to over 92 mbd in the next year, they are likely only being realistic. Their assumption that it may then decline is perhaps more in the nature of wishful thinking. There are however a couple of caveats to that last statement, the first of which is that the decline in demand may be more reflective of a lack of supply capacity (our raison d'être) and alternatively it may reflect, as a result of the first, that prices will rise to influence demand. Nevertheless we remain in a condition where the harsh realities that lie just over the horizon remain obfuscated by other events. 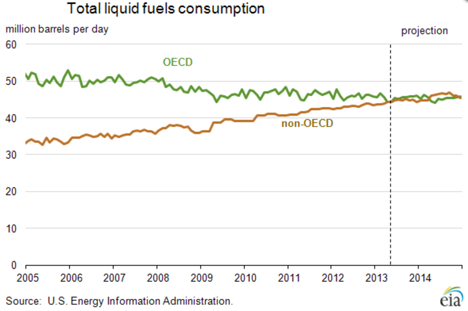 As with many other international agencies the EIA continue to anticipate continued growth in the North American supply of liquid fuels. 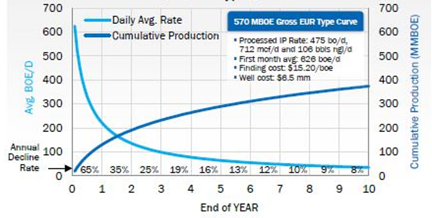 Outside of that growth the increased demand for more than an additional mbd of liquid fuels seems more likely to be likely to be desperately hunting for an invisible savior. 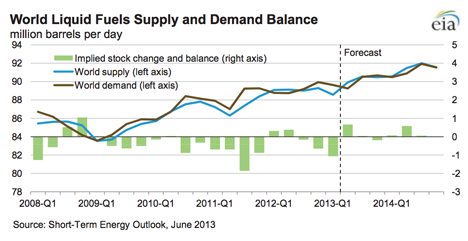 The decline in supply from OPEC in the two years ahead should be noted. It should also be remembered that this is likely to be as much a voluntary control, to ensure price stability in the face of increased North American production, rather than as a result of a short-term supply shortage. However the reality of continued domestic growth in demand in the Middle East, as Westexas has reminded us, is something that cannot be neglected. 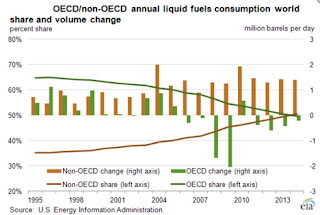 It has been noted that Saudi Arabia, although having less than a third of Germany’s population, recently surpassed it in terms of oil consumption. It will add several new oil-fired power stations including those at Yanbu and Jeddah. 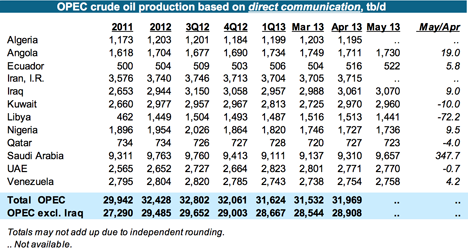 This will feed into an anticipated continued growth in Saudi domestic demand of 5.1% pa.
And this brings us to the OPEC Monthly Oil Market Report (MOMR) for June. OPEC continues to anticipate a global demand growth of 0.8 mbd this year, though they note that there will likely be a growth of 1.2 mbd in the non-OECD nations, requiring a reduction in OECD demand to match the overall forecast. 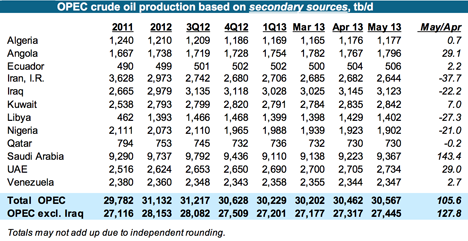 Major growth in demand will continue to be in China (at 0.4 mbd and the Middle East at 0.3 mbd). On the other hand OPEC anticipate cutting their supply (to match anticipated need) by 0.4 mbd over the course of this year. 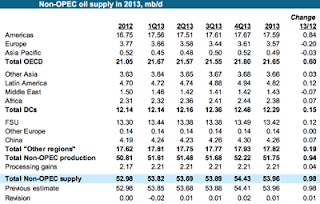 OPEC, therefore, has slightly dropped their projection for year end, however it will still crest above 90 mbd. A large part of demand projection is tied to growth in the global and individual nation economies, and that is a murky crystal ball to view. 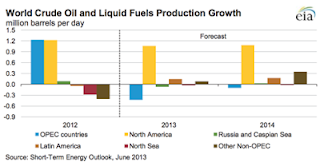 But OPEC anticipates that these economies will continue to grow at an increasing rate, while recognizing that this projection is in an area with a high level of risk in the estimate. The continued, and perhaps growing unrest in the Middle East continues to cast a further shadow over predictions over both supply and the reality of future demand in those countries. And, as one of the less frequently discussed topics, future output from Russia is not as assured as the average analyst appears to assume. 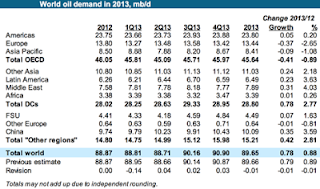 OPEC is anticipating a relatively strong growth in demand in the second half of the year to almost reach 91 mbd by the end of the year. 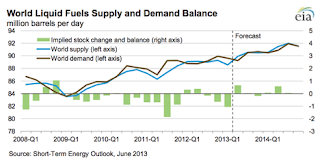 Overall the growth in supply to meet this demand continues to come from North America. 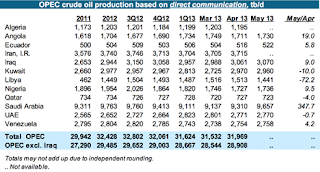 OPEC itself is reporting a slight increase in overall production (by about 128 kbd) although, as always, there are differences in the numbers between those supplied by the countries themselves, and those reported from other sources. There continues to be a significant disparity between the numbers reported from Iran and Venezuela, for example, when other sources are reported to the tune of around 1.5 mbd roughly. 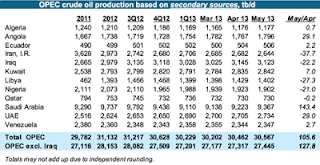 In the short term Iraqi production appears stable. With the continued global reliance on increased production from North America, and, in turn, that reliance on improved production from tight formations, I would be a little more confident of the future were it not for plots such as this, which I recently found. It is a curve that I rather suspect continues to be optimistic. it's best article,thx 4 share. !